Parents, Students, Teachers, Administrators: Open this news item to complete a short survey that will help us improve our technology programs. We appreciate your feedback! Please open the headline for specific information. For detailed information please click on headline. No Resource Hour on Thursday, April 11th. Classes on April 11th begin at 8:00 am. 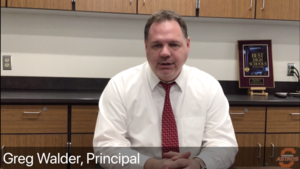 Open this news item to view an important video update from Dr. Walder regarding the e-Learning Day on April 2 and changes to the final exam schedule.